A Plea to All Educators! I’m writing with a plea for help. Feedback, actually. Folger Education creates a study guide to accompany each play Folger Theatre produces with a student matinee. Our aim is to offer teachers background information and activities on the play which they may use with their students for preparation and follow-up of their matinee experience. This is not an uncommon occurance: most theatres that have student matinees also create a guide for teachers and/or students. In scouring to see what information other institutions offer, I have found guides from only a few pages long to close to sixty. Clearly, there is not a lack of things to write about a Shakespeare play. But how much of it is useful to you? In your experience of taking students to see Shakespeare productions, either at the Folger or abroad, what types of preparatory materials have you been offered? To what extent did you use the materials you were given? What would have made them the most useful to you? Your feedback will help us to shape future guides to better serve teachers and students. To see our current study guide for The Comedy of Errors, as well as for past productions, visit us at www.folger.edu/studyguides. The Comedy of Errors opens at Folger Theatre next week, so in celebration I’m “Pinching” two items from our freshly released study guide! The title blatantly states that the play is a comedy, but what does that mean? 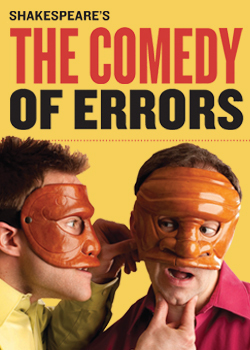 Below are an article about the comedy in Comedy of Errors, and an activity for you and your students! Which of Shakespeare’s Comedies is your favorite? What type of humor makes you laugh? Witty banter? Broad slapstick? Smart satire or clever intrigue? The Comedy of Errors is not a comedy of ideas. It is a situational farce of mistaken identity with occasional dirty word play and violent physical comedy – the Shakespearean equivalent to a popular MTV show featuring young men doing stupid tricks. As long as the person riding his BMX bike off a roof does not become grievously injured, the slapstick is funny. In the same way, both of the Antipholus brothers are unrestrained in occasionally beating the Dromios, yet the violence seems ineffective. Likewise, Egeon’s death hangs over the entire plot of The Comedy of Errors, yet the audience is never afraid that he will actually die. It is not because audiences are desensitized to violence, it is simply that this light, low comedy enables laughter at the situations these characters are in without focusing too much on their physical well-being. Also typical in a farce, the audience is asked to believe in a world that looks similar, but exaggerates and builds upon society’s mistakes. Characters and situations in farces are intensified to an improbable degree, if only to hold a mirror up to society’s foolish actions. For instance, anyone from Syracuse is sentenced to death in Ephesus simply for being a stranger. Although this is extreme, how often does a society impose rules on people from foreign lands based on their nationality? A farce handles the idea lightly, and the audience experiences a kind of catharsis from laughing at the misfortunes of others. Even so, they may be laughing at themselves without realizing it. Plot devices (such as ‘mistaken identity’) are repeated in many of Shakespeare’s comedies. Below is a list of some of the plot devices found in The Comedy of Errors. See if you can name one or more plays where the same device occurs. A complete list of Shakespeare’s comedies is below. 1. A ship brings someone to a foreign land. 2. A twin is mistaken for his/her sibling. 3. The hero/heroine is disguised for protection. 4. A character is so rotund that many jokes are made at his/her expense. 5. Someone is accused of being insane. 6. A character falls in love with the wrong person. 7. A man and woman banter wittily until they realize they’re in love. 8. The play ends in reuniting and marriage. For more activities and insights to discuss with your class, visit www.folger.edu/studyguides. No, we’ve covered the Zombie contingent for now, though I’m sure we’ll return to it at some point! 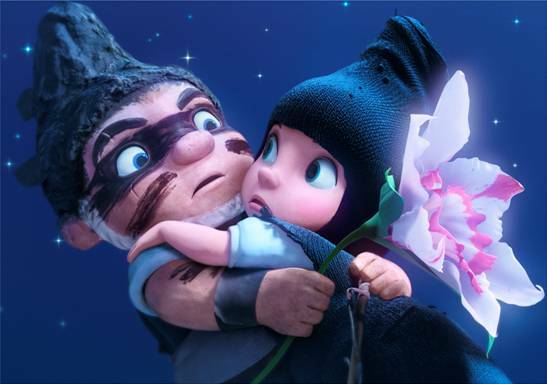 Shakespeare’s work has been colorfully animated many times: The upcoming Gnomeo, the light-hearted Sealed with a Kiss, the epic The Lion King, and – especially – with original language (cut to 25 minutes per play) with Shakespeare: The Animated Tales. The language lends itself to animation because the artwork literally paints the picture that the words create in the reader/animator’s head. You and your students can be animators, too! The video above was created by students from Paint Branch HS with the help of Leila Cabib, who led a week-long animation workshop. On her website she features a short documentary about how her students create their animations. Animating a scene or a quote (given context) gives students the chance to really think about what the words say to them, and the means to show their interpretation creatively. This can be accomplished with programs like Photostory 3 (Windows), Final Cut Pro (Mac), or even getting the process as far as simply Storyboarding with programs like Pixton and Comic Life. Information about many of these programs (and many more!) can be found on Mike’s Resources page. If you (or your students) are interested in animation, a wonderful resource recommended by Leila is the National Film Board of Canada’s “Focus on Animation” Web site. There’s a lot of hands-on activities for younger students, and a plethora of information about the craft of animating and its illustrious history. Are you already using programs like these in your classrooms? If so, do you have any examples you’d like to share? If not, do you see yourself doing any of this with your students? At first glance, it’s cringe-worthy. Nothing seems to be related to Shakespeare’s play at all except the concept: warring families and a young couple in love, yet some ads call it “an animated version of Shakespeare’s play.” It is hardly the first modernized Romeo and Juliet, and is even the second animated version. What about this take makes it special – if it is? From the trailers, I’ve noticed that they’re at least referencing the play a bit: “Get thee to a theatre,” “parting is such sweet sorrow,” a singing bronze Bard… Could it be enough to use in the classroom? It’s certainly got the animated appeal, and (apparently) comic element for an engaged audience. It’s even got Maggie Smith and Michael Caine as the heads-of-house: Lady Blueberry and Lord Redbrick! We’ve talked about Kid-friendly Shakespeare adaptations before, but what do you – as educators – think about this upcoming film? Do you plan to see it, or have any interest at all? One of the things Folger Education has been working on this year is the development of an online course on MACBETH. If you’ve ever taken an online course, what was your experience with it? We plan to offer an eight-week course, meeting once each week for 90 minutes, starting in mid-February. Would you be interested in joining a group of classroom teachers as they demonstrate performance-based approaches to teaching MACBETH? The major elements to be covered in the course include language exploration, verbalizing the inner arguments of the soliloquies, editing and cutting the text, using video and the latest technology to enhance instruction. And we expect teachers taking the course to be able to share their own teaching strategies with colleagues from across the country. Let us know what you think about this idea.